Warning: Arrow is rated TV-14 for mature content, including violence and language. Spoilers included below. Prometheus tortures Oliver in order to get him to spill his secrets. In the flashbacks, Oliver comes head-to-head with Constantine Kovar. I haven't been a complete fan of the Russia flashbacks thus far. Some things were interesting, others weren't; it's been pretty back and forth for me (but definitely better than season four). The same can be said of this episode. If they connected it more fully with the present-day scenes (I don't know--maybe Adrian Chase should be Kovar's son? ), it would be more meaningful. While I haven't been totally invested in the flashbacks this season, this episode had its moments in Russia. I do think the show benefits from the Russia flashbacks because they don't hold back with being gritty and realistic. There is violence, blood, and fighting. It's an important step in telling Oliver's story, so it has its moments of merit. Plus, Anatoly is a great character. I almost had pity for Evelyn in this episode. I almost did. But then she turned around and tricked Oliver again. Freaking again. I want to know more about her than Adrian Chase at this point, though. Why is she doing this? What did Prometheus tell her? She's more interesting than anybody else right now, and we have yet to get anything more about her. Was Team Arrow even in this episode? I forgot if they were because they played no vital part. They did nothing. This episode was isolated to the Adrian vs Oliver scenes and the Russia flashbacks. It was intriguing, but I miss Team Arrow. We need some light in this show, and Curtis and Rene and Felicity (and Rory, where are you?) are that light. While there were many moments in this episode where I adored Oliver, especially for his resilience and strength, I was also disappointed in the turn of events. To make Oliver kill because he "wants to" or because he "enjoys it" is stupid. It washes out everything that has happened over the past five seasons. And it's a problem. Yes, Oliver isn't perfect; he's not a superhero like Superman or the Flash. He has his own ways of dealing with problems, which usually are grittier and often include killing. But to make his entire reasoning for such acts be due to the fact that he wants to is just disappointing and too far. They're making it a part of his nature instead of a choice, so he can't escape it ever. And it makes the show so dark, so depressing. 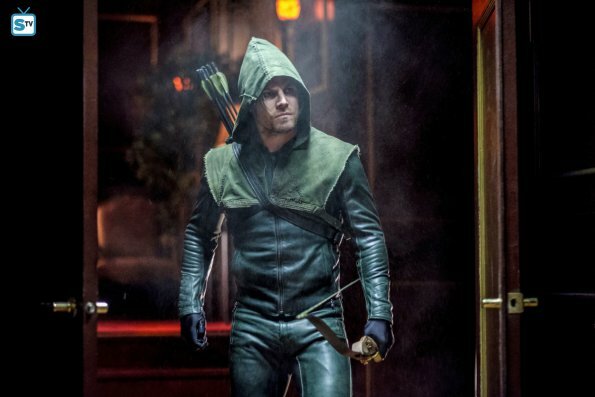 Oliver has come so far since his first days as the hooded vigilante; he has changed his ways, built a new life, and trained many people who trust him. I know Prometheus is digging under Oliver's skin to make him atone for what he's done, but I don't know why there can't be forgiveness and redemption. (After all, he didn't kill Evelyn. He wouldn't even touch her, despite her attempts to attack him.) Oliver as mayor, Oliver as the Green Arrow, Oliver as a hero--all of it vanished during this episode. And while he wants to quit being the Green Arrow and shut down the whole operation, I don't believe it'll stop. Part of it is because I know there is a season six, and I know Oliver won't die, but instead something will happen that will bring him back to being the Green Arrow. But the other part is that I can't believe that this show would come this far only to thrust itself back into darkness. Oliver is supposed to be better. He is better. I don't know why he can't be, why there constantly has to be this "war" between himself and this supposed darkness inside of him, why there is this idea that someone can't be redeemed from their past mistakes. I don't want to live in a world where a person--fictional or real--can't be redeemed. This episode was uncomfortable and depressing. I didn't care for the Russia flashbacks as much because it has been dragging and feels as if nothing is being accomplished there. Adrian Chase is terrifying, Evelyn is terrible, and Oliver has hit rock bottom... again. I don't know where this show is going, but I'm not sure how much I care either. As we get closer to the season finale, I'm counting on some semblance of hope and redemption to pull through, otherwise... I don't want to watch anymore. What did you think of "Kapiushon"?